Columbus, OH, USA; Columbus Blue Jackets left wing Matt Calvert (11) grabs a rebound from a save by St. Louis Blues goalie Jaroslav Halak (41) during the second period at Nationwide Arena. If the Columbus Blue Jackets are going to extend their winning streak to the longest in franchise history, they’re going to have to find some offense against the NHL’s stingiest team. With a seventh straight win in mind, Columbus opens a three-game homestand Tuesday night against the Los Angeles Kings. The Blue Jackets (24-20-4) totaled four goals in three losses to the Kings a season ago, but scoring has been coming rather consistently lately. After Saturday’s 4-3 shootout win at Buffalo, Columbus has scored at least three regulation goals in each game during the streak and outscored opponents 23-12 in that time. Five of those goals have come on the power play in the last three games after Brandon Dubinsky’s second-period goal gave the Blue Jackets a 3-2 lead. They gave up a goal in the final minute of regulation, but Sergei Bobrovsky made three saves in the shootout to ensure they’d match the club’s best winning streak. "It’s a tough thing to give up a goal in the last minute of the game but this is a group that’s faced adversity all season long," said Dubinsky, who also had an assist. "And instead of cowering to it and conceding to just one point, we stuck our heads down and went after them. I’m really proud of this bunch and the way we stuck together through some adversity." Defenseman James Wisniewski assisted on Dubinsky’s goal and has five points on a four-game point streak. Bobrovsky has won each of his last seven starts with a 1.59 goals-against average and .947 save percentage. He’s put up similar numbers in his career against Los Angeles, yielding five goals in three games, but they’ve all resulted in regulation losses. The Kings (29-15-6) fell to 1-1-1 on a five-game road trip Monday with a 3-2 loss at Boston. Jeff Carter’s third-period goal tied it at 2-all after falling behind 2-0 in the first period on a pair of special-teams goals, but Boston retook the lead for good just 18 seconds later. "We gave up a goal on the power play and penalty kill," said defenseman Drew Doughty, who added an assist for the third straight game. "We picked it up in the second, but that was too late. You can’t let that happen." Carter has scored in three straight games and has 10 points in his last 10. Anze Kopitar assisted on Carter’s goal and has a five-game point streak against Columbus. Darryl Sutter’s team is allowing a league-low 1.98 goals per game, but he wasn’t thrilled with his players’ defensive-zone effort against the Bruins. "Our defensemen had a tough night," Sutter told the team’s official website. Jonathan Quick fell to 4-2-2 since returning from injury and allowed over two goals for the second time in that span while making 20 saves. He’s won six of his last seven starts against Columbus while holding them to seven goals in the last five. Los Angeles is winless in its last three against the Eastern Conference, but is 13-4-3 against non-conference foes this season. Columbus is 6-8-1 against the West. 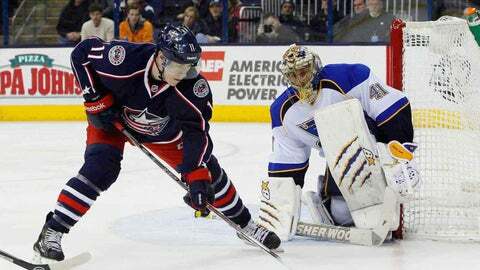 Blue Jackets leading scorer Ryan Johansen (36 points) doesn’t have a point in five career games against Los Angeles.